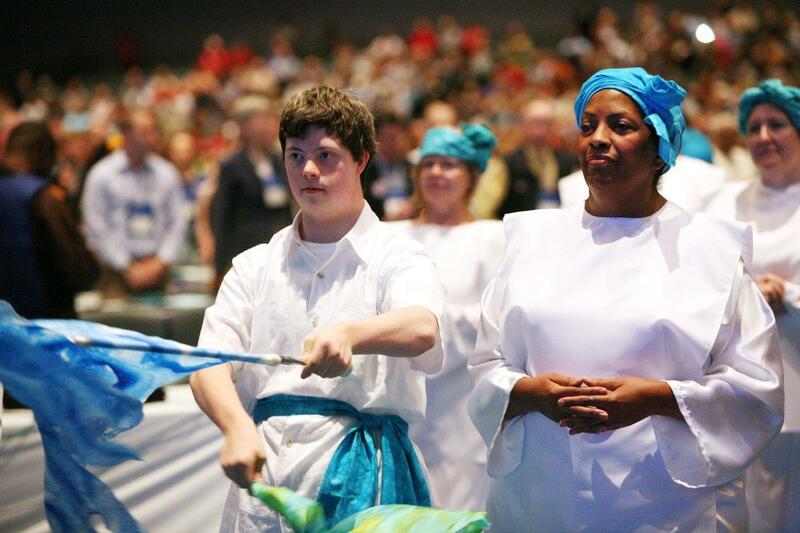 PDC member Alex Brown participating in opening worship service at the 221st General Assembly (2014). Presbyterians for Disability Concerns (PDC) invites you to join us in a prophetic ministry that affirms that every person is created in the image of God and has gifts to bring to the church. Summer is a busy time at Mayfield Central Presbyterian Church. We always have a summer intern from Princeton Theological Seminary and a large part of that student’s internship involves leading Vacation Bible School. It was the first day of VBS and it was a sunny, hot day. The church was buzzing- with staff persons, parents, grandparents, and children of all ages- registering children and getting everything set. Suddenly a woman appeared, sweating, out of breath, and extremely upset, looking to talk to the pastor. She was hysterical. I took her into my office, closed the door, and her story began to pour out in the midst of her hysteria. She has been living in an abusive relationship for the past fifteen years and surviving day by day. She said that today, at breakfast, her husband told her that he was going to kill her. He kept guns in the house and she knew this was a very real possibility. It was not the first time that he had threatened this. But somehow, she knew that, today, he really meant it and that she needed help. She said that she had heard about the pastor that “works with domestic violence” and she decided to come to the church to find her. Because of an underlying medical condition requiring her to take medication, she does not drive. And so she left her home, when her husband left for work, and began the six mile walk to find the church where she believed she would find help. As she was walking along the way on a busy highway, her husband found her, pulled up in his work truck and tried to get her into the truck. He had a gun with him and threatened her again. She ran into the bushes to hide. When she felt it was safe she returned to walking, only to be stopped by her husband again. She managed to get away a second time. The 2015 National Observance of Children’s Sabbaths, “How Long Must I Cry for Help? Bending the Arc Towards God’s Vision of Justice for Children," includes worship, awareness and advocacy resources for use throughout the year, with focus on real solutions to significantly reduce child poverty now. The national observation of Children’s Sabbath, sponsored by the Children’s Defense Fund (CDF), is “a way for faith communities to celebrate children as sacred gifts of the Divine, and provides the opportunity for houses of worship to renew and live out their moral responsibility to care, protect, and advocate for all children.” Read a letter from CDF President Marian Wright Edelman about the 2015 Children’s Sabbath. Our attention should not be limited to that weekend. PHEWA’s Presbyterian Child Advocacy Network (PCAN) invites you to join thousands of churches, synagogues, mosques, temples, and other faith communities across the country in this celebration by holding a community-wide interfaith special worship service or a special worship service in your place of worship- add educational programs, and advocacy activities to engage people of faith in improving the lives of children and their families in your community, state, and in our nation. Download and share this year’s National Observance of Children’s Sabbath® Manual; A Multifaith Resource for Year-Round Child Advocacy, written by the Rev. Shannon Daley-Harris, CDF Senior Religious Advisor and leader in PHEWA's Presbyterian Child Advocacy Network (PCAN). You can access CDF Children's Sabbath resources from previous years from our Presbyterian Child Advocacy Network (PCAN) page. What does it mean to be a mature healthy man? In every society, males of all ages hear and internalize a variety of messages about the definition of, and “appropriate” expression of their masculinity. Some of these messages have very positive impacts on the development and sense of identity of males. Other internalized messages have destructive implications for a man’s well being and those with whom he shares relationships. Internalized messages of identity left unexamined, often create deeply engrained patterns of relationship problems that men struggle with throughout their lives. The lack of a strong forum within the Christian Church designed to encourage men to explore together those qualities, values and practices which make for positive male relationship skills, actually contributes in its absence to the breakdown of healthy dynamics within families and towards significant others. By studying the dynamics exhibited in Jesus’ relationships with a variety of others in his lifetime, this new 13 session curriculum entitled, “Men in the Mirror; Constructing and Applying a Christ-centered Masculinity to Interpersonal Relationships, sets out to explore and address the values that impact men’s relationships giving them the opportunity to critique their own relationship skills and grow in their discipleship to Jesus Christ. This valuable resource was developed by the Rev. Dr. Kevin E. Frederick, Moderator of Presbyterians Against Domestic Violence Network (PADVN), a ministry network of the Presbyterian Health, Education & Welfare Association (PHEWA). Kevin serves as Pastor to the Waldensian Presbyterian Church of Valdese, North Carolina. The Rev. Caitlin Werth, member of PHEWA’s Presbyterian Criminal Justice Network (PCJN) and one of the organizers of our January 2014 Ecumenical Gathering Event, PLACE-MAKING, writes powerful reflections on ministry, with call to action, in her article “The Power of Presence,” in Unbound; An Interactive Journal of Christian Social Justice. Caitlin serves as the director of the HOPE Pre-Release Program at Allegheny County Jail, an inter-faith, rehabilitative, re-entry program for men and women who want to restore their relationship with their God, rebuild their lives, and reconcile to their community. She, like many others, had asked me about her case. Her rights as a parent were in danger of being terminated, and she wanted to get into a housing program before her approaching hearing. I explained to her that I am not a social worker and offered to connect her to one, but I felt compelled to look into her case as well. Like many others who work in a jail full of people eager to find their way out, I am frequently approached with these requests. I found out that she would not be cleared to get into any alternative housing program, as there were warrants out for her arrest in other counties. I debated how to (or even whether I should) share this information with her. Later that day, I went to her housing pod to speak with her again and pass on the message. In March of 2012, Pres­by­te­ri­ans all across the coun­try hand-delivered let­ters to their gov­er­nors, say­ing no to pri­vate pris­ons: not in our state, not any­where. Forty-eight gov­er­nors in total received let­ters faxed, emailed, and deliv­ered. It was the first act of the newly formed Pres­by­ter­ian Crim­i­nal Jus­tice Net­work, based squarely on Gen­eral Assem­bly pol­icy. And it was in direct response to the “cor­rec­tions invest­ment ini­tia­tive” from Cor­rec­tions Cor­po­ra­tion of Amer­ica (CCA) seek­ing to pur­chase state-owned cor­rec­tional facil­i­ties. To ensure prof­itabil­ity, the states would need to com­mit to pri­va­tiz­ing their pris­ons for 20 years and guar­an­tee a 90% pris­oner occu­pancy rate. So much for reha­bil­i­ta­tion and end­ing recidivism. MINNEAPOLIS — Frequently in our church ministry, members and staff come into contact with people who have problems that go beyond their capacity to respond with caring and effectiveness. It is always our desire to respond to those who need our help with the utmost compassion, but on occasion we are faced with situations that are beyond our personal expertise. The Presbyterian Health, Education and Welfare Association (PHEWA) provides the link between presbyteries, congregations, ministers and others with specialized, professional expertise at no cost to those asking for assistance. For more than 50 years, the PHEWA umbrella of networks has helped congregations and the church at large learn how to offer an inclusive welcome. They provide assistance in developing strategies for effective responses to a wide variety of needs encountered in the practice of ministry, both in the congregation and in the surrounding community. Here is the number you will need to designate monies from individuals, churches, presbyteries, and/or synods to support this critical lead organizer position for the PHEWA justice ministry networks around the country. Our sincere thanks for your continued and faithful support. Please consider yourself personally and respectfully requested to organize any of the Presbyterian communities where you serve to set aside some of their budgeted mission money for this purpose and consider a donation, yourself. Your gifts will ensure that the ten volunteer ministry networks of PHEWA remain vital in providing resources and peer support for those engaged in ministries addressing domestic violence, disabilities, HIV and AIDS, serious mental illness, Faith Community Nursing and congregational health ministries, problem pregnancies and reproductive justice, faith-based community organizing, specialized pastoral ministries, child advocacy, and reform of this country's broken criminal justice system. Thank you. Give to this account online. Celebrate the witness of PHEWA’s 2011 John Park Lee Award and Rodney T. Martin Award recipients. Honoring, posthumously, the Rev. Dr. A. David Bos. Accepted by the Rev. Dr. Johanna W.H. van Wijk-Bos. The Rev. Bebe L. and Rolland G. Baldwin. Presented by the Rev. Doug Mitchell.